Instant pot cooking is one of the best modern inventions for a woman who loves cooking, but is pressed for time. It’s a boon to women who don’t even like to cook will fall in love with the cooking with the Instant Pot. For the first time user, there will always be skepticism and disbelief about the ways an instant pot could be used. It’s too good to believe. Women or men who use Instant pot will know that one device could do a wide range of cooking. An Instant Pot is an electric pot that comes with a lot of programmable feature to do multiple varied types of cooking like electric pressure cooker, slow cooker, steamer, to sauté vegetables and also to make soups. All in one pot that is absolutely amazing. Once the food is cooked it keeps the food warm for almost 10 hours. This definitely saves lot of space in kitchen cabinets. This electric appliance has made the life easier for busy women by cooking faster and also ensures convenience. Some of the advantages of the instant pot cooking are its ease of use. We can just set the timer instead of keeping track of number of whistles in a pressure cooker. It does the job of pressure cooker and N number of other things too. Cleaning pans and dishes are the next tiresome job after intensive cooking, especially when you have guests. When you use instant pot, you just need to clean the one pot. And no more spilling on stove top which is just another redundant work when cooked the traditional way. The Instant Pot IP-LUX60 – Pressure Cooker is a 6-in-1 multi-functional cooker. This cooker does the job of six different appliances used for six different types of cooking like pressure cooking, cooking rice, steaming and warming. The speed of the cooking in Instant pot is incomparable with the individual appliances built for that very own purpose. It is measured to be 26 times faster than the other appliances. This instant pot is also eco-friendly, as the energy used by this appliance is 70 percent less. It cooks almost instantly. The embedded microprocessor improves the cooking time and also consumes less energy. We can cook our favorite dishes with just a touch of a button. This instant pot cooker comes with 10 built-in programs ranging from soup, chicken & eggs, Rice, Multigrain, Porridge, cooking beans, doing sauté, steaming and it also does slow cooking. Even the porridges can be cooked perfectly with the porridge option. The nutrition and flavors of the ingredients are preserved to ensure perfectly flavorful dishes. Instant Pot IP-LUX60 is a kitchen friendly appliance that produces no noise or steam and is space-friendly. This instant pot has a stainless steel bowl inside for cooking food. The stainless steel inner pot makes the pot safer with no non-stick coating materials. Non-stick coated dishes poses health issues and concerns these days. Convenience:The single touch operation for the common cooking dishes makes more convenient for the people cooking in the busy hours. As this doesn’t require manual setting or to keep track of the time.Just popping in the required food ingredients and by touching the correct option for cooking will do the job perfectly. The instant pots are programmed to understand the touch button and operate accordingly by calculating the amount of the ingredients while preheating.For e.g., cooking of rice is done in four stages like soaking, blanching, steaming and braising. All these stages are perfectly timed in order to achieve the required food taste that range as “rare”, “medium” and well cooked. Automatic Cooking: The Cooking process is fully automated with the invention of recent technologies by perfectly timing each cooking task or stages. Once cooking is done, the food is kept warm. It is also automated. Delayed Cooking: For a family, especially with both the partners working and kids around it’s always a chaos until the dinner is cooked at the end of the day. In order to solve these issues, the instant pot comes with the Delayed cooking feature.This feature helps to delay the cooking up to 24 hours. Once the ingredients are in cooker, we can set the timer to start cooking after some hours. So dinner will be served by the end of the day or when required. And one need not be confined to kitchen to prepare the meal. Highly Nutritious: Food is cooked in fully controlled and sealed environment. Foods own juices are used for cooking the food, instead of water which dilutes the flavor.Minerals and vitamins are also retained in the food as far the same reason. While being heated, the foods are also not oxidized by exposing it in air. The natural food color of the food is also retained making the food even more appealing. Wide variety of cooking: With just one pot, we can cook variety of dishes that might include the world cuisine ranging from Indian, continental, Chinese and much more. Size: This instant pot is so huge that most of the time, its stored over the counter. It won’t fit much of the lower kitchen cabinets for the frequent usage. So this may not be a best candidate for the families with smaller compact kitchens. Customizing quantity in Instruction booklet: The instructions needs to be followed as per the quantity mentioned in the booklet. If we try to downscale or upscale the food might not be in expected consistency, we may not get the desired results. Sometimes it might overcook or the food might be burned. Missing instructions: Even though the product manual says the Insta Pot IP Lux60 does slow cooking, the instruction for slow cooking is not included. Cook Cycle: The cook cycle may take more time than the time mentioned in the booklet. As a first time user, you need to time the cooking cycles and then you’re your meal. Following the manual blindly won’t be ideal if you’re pressed for time and need to get a meal on the table in the time specified. The Instant pot IP-LUX 60 is the most sought after instant pot available in the market. As it promises, it delivers all the features that are mentioned. Fast:This instant pot has an excellent cooking time which is almost 26 times better than the pressure cooker. But then it’s one of the best models that come with really a very less cooking time, making it more desirable than other brands available in the market. Sturdy: The inner pot is made of stainless steel which is of high quality, sturdy and extremely durable. Cheap – Easy on Money : The instant pot is comparatively cheap to other major brands which promises the same features as of instant pot ip-lux 60, but extremely pricey. Customer Service: The instant pot usually is trouble free but it has an excellent customer service as well. The issues are addressed and taken care of immediately without any delay. The Instant Pot IP-LUX60 is the highly versatile and eco-friendly appliance that perfectly takes care of cooking without any hassles. It helps us to fall in love with cooking by simplifying it. This pot doesn’t require much monitoring while cooking. We can just add the ingredients and set the proper timing and forget about the food completely, unless hungry. Once we get the hang of cooking meals in this instant pot, we can’t get over its awe for the functionality and easy design. And also to top it,a healthy nutritious meal is prepared. All you need to do is find the perfect recipes and cook on. The Instant Pot IP-LUX60 is highly recommended for someone who loves cooking but can’t spend all their time in the kitchen. 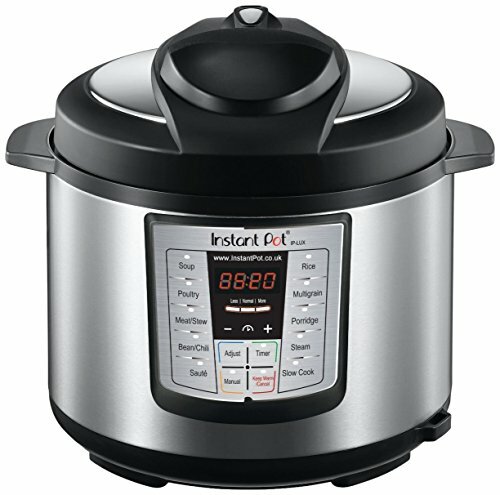 0.1 What is an Instant Pot?